This device is designed to assist in uniformly recording measurement of shotguns and rifles. The fixture is set up so that the top of the firearm rests perpendicular to the buttstock and the measurement block can be quickly moved to the tip of the barrel. This design automatically places the rear of the firearm in the correct position against the backstop. 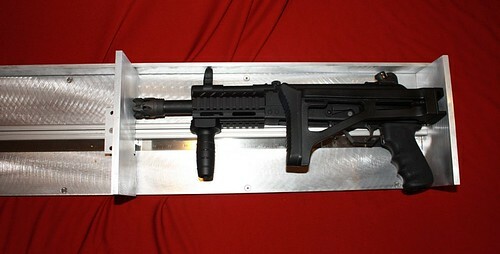 The fixtures are 36" long* and include a removable ISO 17025 certified 36" ruler (and certificate) for measuring firearms. It is made from solid aluminum to provide a lifetime of trouble free service. Also included are 3 (.22 - 12 gauge) rods for measuring barrel length. These rods are made from aluminum and brass and include an adjustable collet. Simply place the rod in the barrel and slip the collet to the tip of the barrel. The design of the collet ensures that it stops at the furthest point of the barrel thus providing an accurate measurement. Unevenly cut sawed off barrels are quickly and accurately measured with this system. Thumb screws on the collet hold it in place so that it can be retracted and measured on the measuring board.